The İzmir leg of Edinburgh World Writers’ Conference held at Yaşar University was quite an inspirational event for the participants: writers from UK, İstanbul and İzmir, academicians, translators, students, professional readers ( as one member of the audience named herself), international guests. And of course literature was in the spotlight for two days as introduced by the Acting Chair and academician Trevor Hope, during his opening speech. We as the audience were lucky enough to hear a number of diverse voices coming through the open windows – some which we recently discovered and some we did not even existed beforehand. Literature in Translation, chaired by academician Jeffrey Hibbert, warmed up the stage for upcoming discussions. 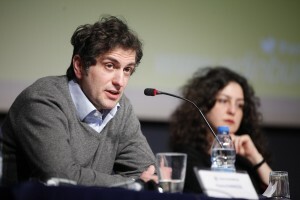 Writer and translator Murat Uyurkulak mentioned the indifference of the “West” for the “East” comparing the the current level of 3 % translated books with the previous 20 % in the 1950′s. Translation helps to cross over the boundaries created by nationalism and history, and the translator brings people closer to each other, he added. A National Literature? the question was addressed by two keynote speakers: writers Sema Kaygusuz from Turkey and Panos Karnezis from Cyprus / UK in the afternoon session. Şebnem İşigüzel described using Twitter as ‘like opening a window and letting go with a loud scream or a strong wind.’ Inci Aral remarked that too much social sharing affects her literary production negatively. Murat Uyurkulak used to resist Twitter but now embraces it as a source of timely and uncensored news. Sema Kaygusuz said that social media will be a powerful platform for sharing once we learn how to use it effectively. -The rise of the novel supported the creation of national communities in history. Is the same thing happening now with globalization or other media (ie movies) taking over this ideological role? -Are there specific literary forms from your cultural roots or literary tradition affecting your writing? -The reader is the recreator of art; does that in any sense inhibit what you put on paper? -Do nations also need narratives to help heal their traumas? The day ended with a reception just in time to allow for short chats with the writers and for turning over the ideas and images of the day in our minds. The next day started with a Session for Aspiring Writers, chaired by writer and translator Kerem Işık. In the afternoon session, writer İnci Aral from Turkey and writer Denise Mina, from Scotland discussed The Future of the Novel. Following a discussion on questions of self and state silencing, activism, the self- consciousness of writer, sources of inspiration, changing stylistic approaches and the impact of visual culture, the day came to an end. So ended the frenetic pace of these two days full of mind-expanding discussions and inspiring conversations on literature. What’s the best thing about EWWC?